Received May 10, 2018; Revised June 10, 2018; Accepted June 25, 2018.; Published online July 11, 2018. Leukocyte common antigen-related protein tyrosine phosphatases (LAR-RPTPs) are cellular receptors of heparan sulfate (HS) and chondroitin sulfate (CS) proteoglycans that regulate neurite outgrowth and neuronal regeneration. LAR-RPTPs have also received particular attention as the major presynaptic hubs for synapse organization through selective binding to numerous postsynaptic adhesion partners. Recent structural studies on LAR-RPTP?mediated trans-synaptic adhesion complexes have provided significant insight into the molecular basis of their specific interactions, the key codes for their selective binding, as well as the higher-order clustering of LAR-RPTPs necessary for synaptogenic activity. In this review, we summarize the structures of LAR-RPTPs in complex with various postsynaptic adhesion partners and discuss the molecular mechanisms underlying LAR-RPTP?mediated synaptogenesis. Receptor protein tyrosine phosphatases (RPTPs) are transmembrane proteins that regulate diverse cellular processes through the precise control of tyrosine phosphorylation of intracellular target proteins (Tonks, 2006). Among them, leukocyte common antigen-related protein tyrosine phosphatases (LAR-RPTPs—LAR, PTPσ and PTPδ in vertebrates, and dLAR in Drosophila) have been implicated in tumorigenic transformation and glucose homeostasis, but are mainly involved in neural development and nerve regeneration (Xu and Fisher, 2012). LAR-RPTPs were originally identified as cellular receptors of proteoglycans (Aricescu et al., 2002; Shen et al., 2009), and are known to modulate both neurite outgrowth and nerve regeneration upon binding to heparan sulfate proteoglycan (HSPG) and chondroitin sulfate proteoglycan (CSPG), respectively (Coles et al., 2011). LAR-RPTPs have recently been highlighted as key synaptic adhesion molecules for synaptogenesis (Coles et al., 2015; Han et al., 2016a). Synaptic adhesion molecules create physical connections across the synaptic cleft and subsequently initiate bidirectional signaling to cause differentiation of both pre- and postsynaptic neurons. In particular, LAR-RPTPs act as a presynaptic nexus that organizes synapses (Takahashi and Craig, 2013; Um and Ko, 2013) by interacting with a wide variety of postsynaptic ligands, including members of the Slit- and Trk-like (Slitrks), neurotrophin receptor tyrosine kinase C (TrkC), interleukin-1 receptor accessory protein (IL-1RAcP), IL-1 receptor accessory protein-like 1 (IL1RAPL1), netrin-G ligand 3 (NGL-3), and synaptic adhesion-like molecules (SALMs) (Choi et al., 2016; Li et al., 2015; Takahashi et al., 2011; 2012; Valnegri et al., 2011; Woo et al., 2009; Yim et al., 2013; Yoshida et al., 2011; 2012). In addition, glypican-4 (GPC-4), a member of the HSPG family, induces synapse development by bridging presynaptic PTPσ and postsynaptic leucine-rich repeat transmembrane protein 4 (LRRTM4) (Ko et al., 2015). Formation of selective LAR-RPTP–mediated trans-synaptic adhesion complexes is governed by the distinctive structural features of LAR-RPTPs and/or the spatiotemporally regulated expression of their corresponding genes. Notably, an emerging body of evidence obtained from recent structural studies on these trans-synaptic adhesion complexes has unveiled the molecular details of their interactions and suggested a molecular mechanism for LAR-RPTP–mediated synaptogenesis. In this review, we will focus on structural insights on LAR-RPTP–mediated trans-synaptic adhesion complexes. The three vertebrate LAR-RPTP family members—LAR, PTPσ and PTPδ—are highly conserved (66–72% identity and 76–82% similarity of protein sequences for the longest isoforms) and share a similar domain architecture consisting of three extracellular immunoglobulin-like (Ig-like) domains, four to eight extracellular fibronectin type III (FNIII) domains (determined by alternative splicing, see the following section for more detail) followed by a single transmembrane helical domain, and two intracellular tandem phosphatase domains: D1 (membrane proximal and catalytically active) and D2 (membrane distal and catalytically inactive) (Fig. 1A). X-ray crystallography and transmission electron microscopy (TEM) analyses of the extracellular structures of LAR-RPTPs have revealed that Ig-like domains and FNIII domains exhibit an extended “beads-on-a string” structure that is flexible with irregular and gentle curves (Coles et al., 2014; Won et al., 2017). When the entire extracellular region of LAR-RPTPs is stretched out, its length is about 35–40 nm, but this flexibility allows it to be topologically compatible with the confined space of the synaptic cleft (15–20 nm wide). Each of the three Ig-like domains has a ‘beta-sandwich’ topology consisting of seven or more antiparallel β-sheets and Ig1–Ig2 domains folded into a conserved V-shaped conformation that is stabilized by inter-domain interactions. Moreover, the crystal structure of LAR Ig1–Ig2 in complex with sucrose octasulfate (SOS), a synthetic heparin-mimic, identified the positively charged patch on the Ig1 domain of PTPσ as the putative binding site for glycosaminoglycans (GAGs), HSPG or CSPG (Coles et al., 2011). Notably, islands of highly sulfated regions that are present in heparan sulfate (HS), but not chondroitin sulfate (CS), induce clustering of LAR-RPTPs. This functional difference enables contrasting functional outcomes of HSPG binding (neurite outgrowth promotion) versus CSPG binding (inhibition of nerve regeneration) to LAR-RPTPs. Structural studies on the cytosolic phosphatase domains of LAR and PTPσ have found that, despite the structural similarities between the tandem D1 and D2 domains, the catalytic Asp residue on the key conserved WPD (Trp-Pro-Asp) loops and the Tyr residue that recognizes the substrate phosphotyrosine in the D1 domain are replaced by Glu and Leu, respectively, in the D2 domain. These subtle conformational differences are the major reason for the lack of catalytic phosphatase activity in the D2 domain (Nam et al., 1999). Instead, the D2 domain of LAR-RPTPs has been suggested to play important roles not only in modulating the catalytic activity of the D1 domain, but also in stabilizing the presynaptic active zone by binding to key downstream effectors such as liprin-α (Pulido et al., 1995; Wallace et al., 1998). Further studies will be required to elucidate the relative orientations of LAR-RPTP’s D1–D2 domains on the synaptic membrane and understand how binding of postsynaptic ligands modulates the catalytic activity of the D1 domain. Each postsynaptic binding partner has a unique code for selectively binding to LAR-RPTP (Fig. 1B). Some trans-synaptic adhesion complexes are spatially regulated (e.g., the PTPδ-Slitrk3 interaction is specific to inhibitory synapses) (Takahashi et al., 2012), and several postsynaptic partners exhibit preferential binding to particular members of the LAR-RPTP family (e.g. IL1RAPL1 and TrkC selectively bind to PTPδ and PTPσ, respectively) (Takahashi et al., 2011; Yoshida et al., 2011). Interestingly, multiple splice sites in the extracellular region of LAR-RPTPs, called mini-exons (MeA–MeD), yield different LAR-RPTP variants. Alternative splicing at the MeA site (amino acid [aa] sequence, GGSPIR for LAR, ETFESTPIR for PTPσ, and ESIGGTPIR for PTPδ) and MeB site (aa sequence, DQRE for LAR and ELRE for PTPσ and PTPδ) regulates the affinity of LAR-RPTPs for their postsynaptic partners. 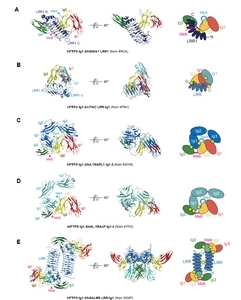 In this section, we describe the detailed structures of the LAR-RPTP–mediated trans-synaptic adhesion complexes, PTPδ/Slitrk, PTPσ/TrkC, PTPδ/IL1RAPL1, PTPδ/IL-1RAcP and PTPδ/SALM5, and elucidate the molecular basis for their specific interactions and splicing-dependent selectivity. Slitrk family (Slitrk1–6) proteins are neuronal transmembrane proteins that possess two consecutive extracellular leucine-rich repeat (LRR) domains (LRR1 and LRR2) that are homologous to the axon guidance molecule Slit, and intracellular C-terminal Tyr residues with sequences homologous to the Trk family (Aruga and Mikoshiba, 2003; Aruga et al., 2003). Among Slitrk members, Slitrk3 can induce inhibitory, but not excitatory, presynaptic differentiation upon binding to PTPδ, whereas other members of the Slitrk family induce both excitatory and inhibitory presynaptic differentiation by binding to PTPσ and PTPδ, respectively (Ko, 2012; Takahashi et al., 2012; Yim et al., 2013). Recent structural studies of PTPδ Ig1–3 in complex with Slitrk1 LRR1 (PDB: 4RCA) and PTPδ Ig1-FN1 in complex with Slitrk2 LRR1 (PDB: 4Y61) have identified the molecular basis for the specific interaction of LAR-RPTPs with the first (LRR1) of the two consecutive LRR domains of Slitrk (Um et al., 2014; Yamagata et al., 2015a). The LRR1 domains of Slitrk1 and Slitrk2 form a horseshoe-like solenoid structures with eight parallel β-strands lining the inner concave surface, where the Ig2 domain and the linker between Ig2 and Ig3 domains of PTPδ predominantly bind through extensive electrostatic interactions and hydrogen bonds (termed interface A and B, respectively) (Fig. 2A). The MeB splicing insert at the linker between Ig2–Ig3 domains of PTPδ not only mediate PTPδ binding to the negatively charged pocket on the concave surface of Slitrk LRR1 (interface B), it also lengthens the linker between Ig2 and Ig3 domains of PTPδ, thus preventing steric hindrance between PTPδ Ig3 and Slitrk LRR1. Intriguingly, the key interacting residues on interface A and B are highly conserved in all Slitrk and LAR-RPTP members, respectively. In contrast, the MeA splicing insert of PTPδ, which is located away from the interaction interface between Slitrk and PTPδ, has no effect on Slitrk and PTPδ binding or synaptogenic functions. Although LAR containing an MeB splicing insert can bind to Slitrk1 in vitro, the form of LAR that is primarily expressed in mouse brains does not contain an MeB splice insert (Li et al., 2015; Um et al., 2014), explaining why LAR is not involved in the synaptogenic activity of Slitrk family proteins. Despite the fact that the Ig3 domain of PTPδ also interacts with the LRR1 domain of Slitrk1 (termed interface C) and Slitrk2, its mode of binding to Slitrk1 is quite different from that to Slitrk2. Moreover, mutations in residues on the C interface (Slitrk or PTPδ), which are less conserved, do not affect Slitrk–PTPδ binding or Slitrk-mediated presynaptic differentiation. These observations indicate that the interaction between Slitrk LRR1 and PTPδ Ig3 domains may not be critical for formation of this trans-synaptic adhesion complex or its synaptogenic function. Total expression levels of splicing isoforms PTPσ and PTPδ (MeB+) are decreased in cultured hippocampal neurons between DIV5 (5 days in vitro) and DIV10 (Um et al., 2014), suggesting that Slitrk-dependent synaptogenesis (at excitatory or inhibitory synapses), which is mainly mediated by the MeB splice variant of LAR-RPTPs (PTPσ and PTPδ), is important for initial synapse formation rather than late-stage synapse maturation. Structural comparison of LRR1 and LRR2 (PDB: 3M18) domains of Slitrk1 have revealed that, although their overall structures are very similar, distinct structural features of the LRR2 domain, including an occluded binding pocket and conflicting electrostatic charge with Slitrks, are the major reason for the selective binding of LAR-RPTPs to Slitrk LRR1 and not to LRR2 (Um et al., 2014). Although the exact role of the LRR2 domain has not yet been established, Slitrk missense mutations located within the LRR2 domain are often closely associated with neuropsychiatric disorders (Kang et al., 2016). Thus, it is possible that the LRR2 domain of Slitrks has its own functions in synaptogenesis or binds to other cellular partners, a possibility that warrants further investigation. The most significant finding from this structural study is that lateral interactions between adjacent trans-synaptic LAR-RPTPs/Slitrks complexes observed in crystal lattices are critical for Slitrk1-induced lateral assembly and synaptogenic activity. In other words, Slitrk1 mediates presynaptic differentiation via a two-step process that includes direct binding to LAR-RPTPs and subsequent local clustering, as also confirmed in the case of the LAR-RPTP/Slitrk3 complex (Won et al., 2017). Although key residues of Slitrk1 involved in clustering of trans-synaptic LAR-RPTP/Slitrk complexes are not well conserved in other Slitrks, the clustering of LAR-RPTP upon binding to synaptic adhesion partners is most likely a primary determinant of LAR-RPTP–mediated synaptogenesis (see PTPδ/IL1RAPL1 and PTPδ/IL-1RAcP complexs for more detail). Trk family, consisting of TrkA, TrkB and TrkC, are receptor tyrosine kinases that recognize neurotrophins such as nerve growth factor (NGF), brain-derived neurotrophic factor (BDNF), neurotrophin-3 (NT-3), and neurotrophin-4 (NT-4) (Barbacid, 1994). The extracellular region of Trk family proteins exhibits a common architecture consisting of an N-terminal LRR domain and two Ig-like domains (Ig1 and Ig2). The structures of the NGF and Trk family complexes, NGF/TrkA (PDB: 1WWW) and NT-4/TrkB (PDB: 1HCF), reveal that the Ig2 domain of the Trk family is necessary and sufficient for NGF family binding (Banfield et al., 2001; Wiesmann et al., 1999). Among Trk family members, TrkC is the specific receptor for NT-3 in neuronal development processes, such as survival and proliferation of neural precursor cells, neural differentiation, and neuron survival. Recently, an additional role for TrkC as a synapse-organizing protein has also been identified. Specifically, presynaptic PTPσ, but not PTPδ or LAR, was shown to bind to TrkC and induce excitatory synapse development (Takahashi et al., 2011). Interestingly, the PTPσ binding sites in TrkC required for synaptogenic function are the LRR domain and the Ig1 domain, which is distinct from NT-3 binding sites in TrkC. The structure of the minimal binding complex, PTPσ Ig1–2/TrkC LRR-Ig1 (PDB: 4PBV), reveals binding of a V-shaped PTPσ Ig1–Ig2 to an L-shaped TrkC LRR-Ig1 with 1:1 stoichiometry. Interestingly, the PTPσ Ig2 domain was shown to bind to the convex surface of the TrkC LRR domain, whereas the PTPδ Ig2 domain bound to the concave surface of the Slitrk LRR1 domain. In contrast, the concave surface of the TrkC LRR domain was found to interact with the Ig1 domain of TrkC from a neighboring PTPσ Ig1–2/TrkC LRR-Ig1 complex in a head-to-tail manner. The three major interaction interfaces between TrkC and PTPσ—site 1, PTPσ Ig1 (R96 and R99)-TrkC Ig1 (D240 and D242); site 2, PTPσ Ig1 (Q75 and E78)-TrkC LRR Ig1 inter-domain region (E287, Q148, R121); and site 3, PTPσ Ig2 (K203)-TrkC LRR (E100)—mainly associate through electrostatic interactions. The key residues of TrkC in these interacting interface are generally not conserved across other Trk family members, explaining why TrkC is the only target for PTPσ (Coles et al., 2014; Takahashi et al., 2011) (Fig. 2B). In addition, replacement of several interface residues of PTPσ with the respective residues of PTPδ or LAR was shown to reduce binding affinity toward TrkC, which also explains the preferential binding of TrkC to PTPσ relative to PTPδ and LAR (Coles et al., 2014). The MeA splicing insert in PTPσ is positioned on the opposite side of the TrkC-binding interface, and thus exerts no influence on PTPσ/TrkC interactions. Although the crystal structure of the PTPσ Ig1–3 (MeB−)/TrkC LRR-Ig1 complex (PDB: 4PBW) could not clearly resolve the detailed interactions of TrkC with the Ig2–Ig3 linker and Ig3 domain of PTPσ, likely owing to the low-resolution structure, additional observed features suggested that the MeB splicing insert of PTPσ could disrupt the putative fourth auxiliary interaction site between TrkC and PTPσ (Coles et al., 2014). The contrasting effects of the MeB splicing insert on binding to two different postsynaptic partners, TrkC and Slitrks, indicate that alternative splicing of LAR-RPTPs is a sophisticated, and critical code that controls the binding preference to various postsynaptic partners. Interestingly, the Arg residues, R96 and R99, in PTPσ, which are critical for interactions with TrkC, are also among the known HSPG binding sites (K67, K68, K70, K71, R96 and R99) (Coles et al., 2011); indeed, the HS-mimetic dp10 inhibits TrkC-mediated presynaptic differentiation (Coles et al., 2014). These observations suggest that HSPGs at synapses act as competitive inhibitors of trans-synaptic PTPσ/TrkC complexes. Another modulator of the trans-synaptic PTPσ/TrkC complex is NT-3. Like other neurotrophins, NT-3 is known to play a critical role in neuronal survival and differentiation, and axon outgrowth. NT-3 binds to the Ig2 domain of TrkC, thereby promoting formation of Trk dimers, inducing transphosphorylation of Trk cytoplasmic domain tyrosine residues, and subsequently activating intracellular signaling (Banfield et al., 2001; Barbacid, 1994). In contrast to NT-3, PTPσ binds to LRR-Ig1 of TrkC. Therefore, NT-3 exerts its modulatory effects on synaptogenesis by enhancing interactions between PTPσ and TrkC (Ammendrup-Johnsen et al., 2015; Han et al., 2016b). However, further structural studies of the ternary PTPσ/TrkC/NT-3 complex are necessary to determine the molecular basis of the cooperative role of NT-3 in PTPσ/TrkC-mediated synaptogenesis. IL1RAPL1, which is selectively expressed in the brain, was initially identified as a mental retardation- and autism-associated protein (Carrie et al., 1999; Piton et al., 2008). IL-1RAcP shares 52% homology with IL1RAPL1, and has been reported to be a co-receptor for IL-1 receptor I (IL1-RI), which simultaneously binds the IL-1 cytokine, IL-1β, to mediate immune and inflammatory signaling (Sims and Smith, 2010). Both IL1RAPL1 and IL-1RAcP belong to the IL-1/Toll receptor family and contain three Ig-like domains in the extracellular region and a Toll/IL-1 receptor (TIR) domain in the cytoplasmic portion. It has recently been reported that IL1RAPL1 and IL-1RAcP can function as synaptic organizers to induce excitatory, but not inhibitory, synapse formation (Valnegri et al., 2011; Yoshida et al., 2011; 2012). Although in vitro and cell-surface binding assays have shown that IL-1RAcP is capable of binding to all LAR-RPTP members (LAR, PTPσ and PTPδ) with slightly different binding affinities, presynaptic PTPδ containing specific types of splicing inserts are critical for the synaptogenic activity of IL1RAPL1 and IL-1RAcP in vivo. The crystal structure of the human PTPδ/IL1RAPL1 complex (PDB: 5WY8) and corresponding mouse complex (PDB: 4YH7) reveal that IL1RAPL1 Ig1-3 exhibits an L-shaped configuration and that the V-shaped PTPδ Ig1–2 is clamped between the IL1RAPL1 Ig1 and Ig3 domains through interactions of Ig1, Ig2 and Ig3 patches (Won et al., 2017; Yamagata et al., 2015b) (Fig. 2C). The overall shape of the PTPδ/IL-1RAcP complex (PDB: 4YFD) resembles that of the PTPδ/IL1RAPL1 complex, but the relative orientation between the Ig1 and Ig2–Ig3 domains of IL-1RAcP in the PTPδ/IL-1RAcP complex is changed by 20 degrees compared with that of IL1RAPL in the PTPδ/IL1RAPL1 complex (Yamagata et al., 2015b) (Fig. 2D). Therefore, interactions in Ig1 patches of the PTPδ/IL1RAPL1 complex are disrupted in the PTPδ/IL-1RAcP complex, whereas other interaction interfaces of the PTPδ/IL1RAPL1 complex (Ig2 and Ig3 patches) are mostly maintained in the PTPδ/IL-1RAcP complex. Similar to the case for Slitrk and TrkC, the binding specificities of IL1RAPL1 and IL-1RAcP are regulated by the splicing inserts in PTPδ. Notably, the MeA splicing insert of PTPδ (E181, T186 and P187) extensively interacts with the Ig1 domain of IL1RAPL1, but only partially interacts with that of IL-1RAcP; thus, alternative splicing of the MeA insert of PTPδ exerts a greater effect on the binding affinity for IL1RAPL1 than for IL-1RAcP. The MeB splicing insert in the flexible linker between the Ig2 and Ig3 domains of PTPδ contributes to adjusting their relative spacing and orientation, enabling the Ig1 domain of IL-1RAcP or IL1RAPL1 to be clamped between Ig2 and Ig3 domains of PTPδ. Interestingly, novel lateral-interaction interfaces between two neighboring PTPδ Ig1–3/IL1RAPL1 complexes have also been identified from the crystal lattice (PDB: 5WY8), and shown to be crucial for the clustering and synaptogenic activity of PTPδ/IL1RAPL1 complexes, similar to the case for LAR-RPTP/Slitrk1 trans-synaptic adhesion complexes. The distance between C-termini in neighboring IL1RAPL1 molecules in two PTPδ Ig1–3/IL1RAPL1 complexes coincides with the distance between the two TIR domains of a ligand-bound TLR dimer (Park et al., 2009). This suggests that PTPδ binding to IL1RAPL1 induces lateral clustering of trans-synaptic adhesion complexes and brings the cytosolic TIR domains of neighboring IL1RAPL1s into close enough proximity to activate the downstream signaling cascades necessary for synaptogenesis in the postsynaptic neuron. As noted here and in PTPδ/Slitrk complex, binding of either IL1RAPL1 or Slitrk1 induces LAR-RPTP clustering, but the critical residues in LAR-RPTPs necessary for the clustering of these trans-synaptic adhesion complexes are not identical. This also implies that the specific interface that drives their clustering is dependent on the postsynaptic adhesion ligand. A structural comparison of the PTPδ/IL-1RAcP complex with the ternary IL-1β/receptor signaling complex, IL-1β/IL-1RI/IL-1RAcP (PDB: 3O4O and 4DEP) reveals that the binding region of IL-1RAcP for the IL-1β/IL-1RI complex is completely different from that for PTPδ (Thomas et al., 2012; Wang et al., 2010). Given that IL-1RI is also expressed in neuronal cells and that IL-1β is intimately involved in the elaboration of acute neuroinflammation (Friedman, 2001; Shaftel et al., 2008), it is possible that IL-1RI and/or IL-1β affect PTPδ/IL-1RAcP complex-mediated synaptogenic activity under certain neuroinflammatory conditions, a situation reminiscent of NT-3 binding to the PTPδ/TrkC complex; however, there is currently no direct evidence to support this speculation. The SALM family (SALM1-5), also known as leucine-rich repeat (LRR) and fibronectin III domain-containing (LRFN) proteins, has recently emerged as a family of postsynaptic organizers. Interestingly, only SALM3 and SALM5 have been reported to possess synaptogenic activity through interactions with presynaptic LAR-RPTPs (Choi et al., 2016; Li et al., 2015; Mah et al., 2010). SALM family members commonly contain an LRR domain, an immunoglobulin-like (Ig) domain and a fibronectin type III (FNIII) domain in the extracellular region, but only SALMs 1–3 contain a PDZ domain binding motif in the cytoplasmic region (Lie et al., 2018). The crystal structures of the PTPδ/SALMs complexes, PTPδ Ig1–3/SALM5 LRR-Ig1 (PDB: 5XNP), PTPδ Ig1-FN1/SALM5 LRR-Ig1 (PDB: 5XWT) and PTPδ Ig1–3/SALM2 LRR-Ig1 (PDB: 5XWU), reveal that PTPδ and SALM5 form a 2:2 hetero-tetrameric complex (Goto-Ito et al., 2018; Lin et al., 2018) (Fig. 2E). Each PTPδ molecule binds to only one SALM5 protomer and not the other. The Ig2 and Ig3 domains of PTPδ sandwich the Ig domain of SALM5, and the Ig2 domain of PTPδ also interacts with the LRR domain of SALM5. The interactions between PTPδ and SALM5 occur at three interfaces: PTPδ Ig2-SALM5 LRR (site 1), PTPδ Ig2-SALM5 Ig (site 2), and PTPδ Ig3-SALM5 Ig (site 3). The key residues of PTPδ in the three interacting interfaces are highly conserved in LAR and PTPσ, suggesting that SALM5 would bind to them in a manner similar to that of PTPδ. As is the case for the PTPδ/Slitrk complex, the MeA splice insert of PTPδ is not involved in PTPδ binding to SALM5, and the MeB-containing linker connecting Ig2 and Ig3 domains of PTPδ is stretched along SALM5, enabling PTPδ Ig3 to interact with SALM5 Ig. However, the MeB splicing insert in PTPδ has no direct interaction with SALM5. Interestingly, a unique structural feature of SALM5 is that it exists as a dimer, not only in the crystallographic lattice, but also in solution, as confirmed by size-exclusion chromatography coupled with multi-angle laser light scattering (SEC-MALS) (Goto-Ito et al., 2018). The homodimeric interaction is mediated by the LRR domain of each SALM5 protomer. The disruption of this dimeric interface of the SALM5 LRR domain suppresses the synaptogenic activity of SALM5, suggesting that SALM5 dimerization is critical for PTPδ-mediated presynaptic differentiation (Goto-Ito et al., 2018; Lin et al., 2018). Moreover, the antiparallel side-by-side packing architecture of the SALM5 dimer is likely in an ideal orientation for cis-interaction of two postsynaptic SALM5 molecules. Notably, the residues involved in the dimeric interface of SALM5 are highly conserved in all SALMs members, suggesting that cis-interactions between different SALM family members can also be formed through SALM-SALM heterodimerization to regulate synapse development and functions. Members of the LAR-RPTP family are emerging presynaptic hubs for synapse organization. The interaction of LAR-RPTPs with numerous synaptic adhesion partners generates a complicated molecular network. In recent years, structural studies of LAR-RPTP–mediated trans-synaptic adhesion complexes have significantly extended our understanding of their binding modes, as exemplified by the diverse, but specific, binding of Ig domains of LAR-RPTPs to various postsynaptic adhesion partners and the critical role of alternative splicing inserts of LAR-RPTPs as selective binding codes. Notably, PTPδ/Slitrk and PTPδ/IL1RAPL1 structures have provided novel insight into functional properties, showing that LAR-RPTP binding to postsynaptic adhesion ligands induces higher-order clustering of the trans-synaptic adhesion complex; this is likely a general mechanism for LAR-RPTP-mediated synaptogenesis similar to that of other adhesion complexes, such as β-neurexin/neuroligin, Eph receptor/ephrin, cadherins, and SynCAM1 (Dean et al., 2003; Fogel et al., 2011; Harrison et al., 2011; Himanen et al., 2010; Seiradake et al., 2010; Tanaka et al., 2012). Interestingly, it has also been reported that pre-established LAR-RPTP–mediated trans-synaptic adhesion complexes can be dismantled by the dominant binding of HS to LAR-RPTPs in vitro and in cell-based assays (Won et al., 2017). These recent structural and functional studies raise important new questions relating to the specific and/or cooperative role of each postsynaptic adhesion partner of LAR-RPTP; the synergetic and/or competitive modulation of LAR-RPTP-mediated synaptogenesis by other factors, such as HSPG, CSPG, NT-3 and IL-1; the key intracellular signal pathways at pre- and/or postsynaptic sites induced by higher-order clustering of the LAR-RPTP-mediated trans-synaptic adhesion complexes; and crosstalk among LAR-RPTP-based and neurexin-based synapse organization. The answers to these questions can ultimately be translated into clinical strategies for the treatment of neurological disorders. Fig. 1. (A) Schematic domain organization of LAR-RPTPs (left) and the proposed structure of full-length LAR-RPTPs (right). The extracellular region of LAR-RPTPs contain three N-terminal Ig-like domains followed by fibronectin type III domains, which are modified by alternative splicing to contain four to eight modules. Tandem phosphatase domains (catalytically active D1 and catalytically inactive D2) are present in the intracellular region of LAR-RPTPs. The depiction of the structure on the right side is based on the crystal structures of the PTPσ Ig1-FN3 (PDB: 4PBX) domain and LAR D1–D2 (PDB: 1LAR) domain. (B) Schematic diagram depicting the trans-synaptic network between LAR-RPTPs and postsynaptic binding partners. Three members of the LAR-RPTP family (PTPσ, PTPδ, and LAR) and their postsynaptic adhesion partners form highly specific trans-synaptic interactions. LAR-RPTPs organize excitatory synapses upon binding to these ligands, except Slitrk3, which are specific to inhibitory synapses. The relative positions of MeA, MeB, MeC, and MeD splicing inserts are indicated by arrowheads above each LAR-RPTP subtype. 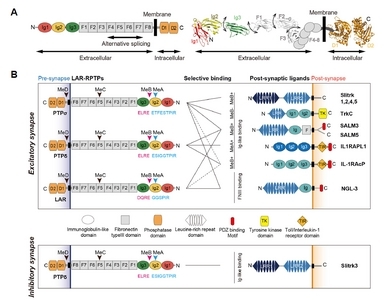 The splicing inserts MeA (ETFESTPIR for human PTPσ, and ESIGGTPIR for human PTPδ, and GGSPIR for human LAR) and MeB (ELRE for human PTPσ and PTPδ, and DQRE for human LAR) of LAR-RPTPs, which are highly conserved among various species, are important for determining binding affinities toward different ligands. Preferential binding pairs between LAR-RPTPs and postsynaptic ligands are indicated by solid lines; relatively weak interactions observed in vitro are indicated by dotted lines. The LAR-RPTP splicing variant that elicits the strongest binding with each ligand is indicated beside the N-terminus of the corresponding postsynaptic ligand. Abbreviations: Ig, Ig-like domain (Ig1, red; Ig2, yellow; and Ig3, green); F, fibronectin-like domain (light gray); D1 and D2, phosphatase domains; N, N-termini; C, C-termini; LRR, leucine-rich repeat; TIR, Toll/IL-1 receptor homology; TK, tyrosine kinase. Fig. 2. Overall structures (left) and schematic depictions (right) of the LAR-RPTP–mediated trans-synaptic adhesion complexes, PTPδ/Slitrk1 (A), PTPσ/TrkC (B), PTPδ/IL1RAPL1 (C), PTPδ/IL-1RAcP (D), and PTPδ/SALM5 (E). In the left panel, two different views of the indicated complex structure are shown in cartoon representations. The right panel depicts the schematic binding mode of LAR-RPTP–mediated trans-synaptic adhesion complexes. The yellow stars represent binding interfaces in these complexes. The color scheme is the same as that in . The MeA and MeB splice inserts are shown in cyan and magenta, respectively. Ammendrup-Johnsen, I., Naito, Y., Craig, A.M., and Takahashi, H. (2015). Neurotrophin-3 enhances the synaptic organizing function of TrkC-protein tyrosine phosphatase sigma in rat hippocampal neurons. J Neurosci. 35, 12425-12431. Aricescu, A.R., McKinnell, I.W., Halfter, W., and Stoker, A.W. (2002). Heparan sulfate proteoglycans are ligands for receptor protein tyrosine phosphatase sigma. Mol Cell Biol. 22, 1881-1892. Aruga, J., and Mikoshiba, K. (2003). Identification and characterization of Slitrk, a novel neuronal transmembrane protein family controlling neurite outgrowth. Mol Cell Neurosci. 24, 117-129. Aruga, J., Yokota, N., and Mikoshiba, K. (2003). Human SLITRK family genes: genomic organization and expression profiling in normal brain and brain tumor tissue. Gene. 315, 87-94. Banfield, M.J., Naylor, R.L., Robertson, A.G., Allen, S.J., Dawbarn, D., and Brady, R.L. (2001). Specificity in Trk receptor:neurotrophin interactions: the crystal structure of TrkB-d5 in complex with neurotrophin-4/5. Structure. 9, 1191-1199. Barbacid, M. (1994). The Trk family of neurotrophin receptors. J Neurobiol. 25, 1386-1403. Carrie, A., Jun, L., Bienvenu, T., Vinet, M.C., McDonell, N., Couvert, P., Zemni, R., Cardona, A., Van Buggenhout, G., and Frints, S. (1999). A new member of the IL-1 receptor family highly expressed in hippocampus and involved in X-linked mental retardation. Nat Genet. 23, 25-31. Choi, Y., Nam, J., Whitcomb, D.J., Song, Y.S., Kim, D., Jeon, S., Um, J.W., Lee, S.G., Woo, J., and Kwon, S.K. (2016). SALM5 trans-synaptically interacts with LAR-RPTPs in a splicing-dependent manner to regulate synapse development. Sci Rep. 6, 26676. Coles, C.H., Jones, E.Y., and Aricescu, A.R. (2015). Extracellular regulation of type IIa receptor protein tyrosine phosphatases: mechanistic insights from structural analyses. Semin Cell Dev Biol. 37, 98-107. Coles, C.H., Mitakidis, N., Zhang, P., Elegheert, J., Lu, W., Stoker, A.W., Nakagawa, T., Craig, A.M., Jones, E.Y., and Aricescu, A.R. (2014). Structural basis for extracellular cis and trans RPTPsigma signal competition in synaptogenesis. Nat Commun. 5, 5209. Coles, C.H., Shen, Y., Tenney, A.P., Siebold, C., Sutton, G.C., Lu, W., Gallagher, J.T., Jones, E.Y., Flanagan, J.G., and Aricescu, A.R. (2011). Proteoglycan-specific molecular switch for RPTPsigma clustering and neuronal extension. Science. 332, 484-488. Dean, C., Scholl, F.G., Choih, J., DeMaria, S., Berger, J., Isacoff, E., and Scheiffele, P. (2003). Neurexin mediates the assembly of presynaptic terminals. Nat Neurosci. 6, 708-716. Fogel, A.I., Stagi, M., Perez de Arce, K., and Biederer, T. (2011). Lateral assembly of the immunoglobulin protein SynCAM 1 controls its adhesive function and instructs synapse formation. EMBO J. 30, 4728-4738. Friedman, W.J. (2001). Cytokines regulate expression of the type 1 interleukin-1 receptor in rat hippocampal neurons and glia. Exp Neurol. 168, 23-31. Goto-Ito, S., Yamagata, A., Sato, Y., Uemura, T., Shiroshima, T., Maeda, A., Imai, A., Mori, H., Yoshida, T., and Fukai, S. (2018). Structural basis of trans-synaptic interactions between PTPdelta and SALMs for inducing synapse formation. Nat Commun. 9, 269. Han, K.A., Jeon, S., Um, J.W., and Ko, J. (2016a). Emergent synapse organizers: LAR-RPTPs and their companions. Int Rev Cell Mol Biol. 324, 39-65. Han, K.A., Woo, D., Kim, S., Choii, G., Jeon, S., Won, S.Y., Kim, H.M., Heo, W.D., Um, J.W., and Ko, J. (2016b). Neurotrophin-3 Regulates Synapse Development by Modulating TrkC-PTPsigma Synaptic Adhesion and Intracellular Signaling Pathways. J Neurosci. 36, 4816-4831. Harrison, O.J., Jin, X., Hong, S., Bahna, F., Ahlsen, G., Brasch, J., Wu, Y., Vendome, J., Felsovalyi, K., and Hampton, C.M. (2011). The extracellular architecture of adherens junctions revealed by crystal structures of type I cadherins. Structure. 19, 244-256. Himanen, J.P., Yermekbayeva, L., Janes, P.W., Walker, J.R., Xu, K., Atapattu, L., Rajashankar, K.R., Mensinga, A., Lackmann, M., and Nikolov, D.B. (2010). Architecture of Eph receptor clusters. Proc Natl Acad Sci USA. 107, 10860-10865. Kang, H., Han, K.A., Won, S.Y., Kim, H.M., Lee, Y.H., Ko, J., and Um, J.W. (2016). Slitrk missense mutations associated with neuropsychiatric disorders distinctively impair slitrk trafficking and synapse formation. Front Mol Neurosci. 9, 104. Ko, J. (2012). The leucine-rich repeat superfamily of synaptic adhesion molecules: LRRTMs and Slitrks. Mol Cells. 34, 335-340. Ko, J.S., Pramanik, G., Um, J.W., Shim, J.S., Lee, D., Kim, K.H., Chung, G.Y., Condomitti, G., Kim, H.M., and Kim, H. (2015). PTPsigma functions as a presynaptic receptor for the glypican-4/LRRTM4 complex and is essential for excitatory synaptic transmission. Proc Natl Acad Sci USA. 112, 1874-1879. Li, Y., Zhang, P., Choi, T.Y., Park, S.K., Park, H., Lee, E.J., Lee, D., Roh, J.D., Mah, W., and Kim, R. (2015). Splicing-dependent trans-synaptic SALM3-LAR-RPTP interactions regulate excitatory synapse development and locomotion. Cell Rep. 12, 1618-1630. Lie, E., Li, Y., Kim, R., and Kim, E. (2018). SALM/Lrfn family synaptic adhesion molecules. Front Mol Neurosci. 11, 105. Lin, Z., Liu, J., Ding, H., Xu, F., and Liu, H. (2018). Structural basis of SALM5-induced PTPdelta dimerization for synaptic differentiation. Nat Commun. 9, 268. Mah, W., Ko, J., Nam, J., Han, K., Chung, W.S., and Kim, E. (2010). Selected SALM (synaptic adhesion-like molecule) family proteins regulate synapse formation. J Neurosci. 30, 5559-5568. Nam, H.J., Poy, F., Krueger, N.X., Saito, H., and Frederick, C.A. (1999). Crystal structure of the tandem phosphatase domains of RPTP LAR. Cell. 97, 449-457. Park, B.S., Song, D.H., Kim, H.M., Choi, B.S., Lee, H., and Lee, J.O. (2009). The structural basis of lipopolysaccharide recognition by the TLR4-MD-2 complex. Nature. 458, 1191-U1130. Piton, A., Michaud, J.L., Peng, H., Aradhya, S., Gauthier, J., Mottron, L., Champagne, N., Lafreniere, R.G., Hamdan, F.F., and team, S.D. (2008). Mutations in the calcium-related gene IL1RAPL1 are associated with autism. Hum Mol Genet. 17, 3965-3974. Pulido, R., Serra-Pages, C., Tang, M., and Streuli, M. (1995). The LAR/PTP delta/PTP sigma subfamily of transmembrane protein-tyrosine-phosphatases: multiple human LAR, PTP delta, and PTP sigma isoforms are expressed in a tissue-specific manner and associate with the LAR-interacting protein LIP.1. Proc Natl Acad Sci USA. 92, 11686-11690. Seiradake, E., Harlos, K., Sutton, G., Aricescu, A.R., and Jones, E.Y. (2010). An extracellular steric seeding mechanism for Eph-ephrin signaling platform assembly. Nat Struct Mol Biol. 17, 398-402. Shaftel, S.S., Griffin, W.S., and O’Banion, M.K. (2008). The role of interleukin-1 in neuroinflammation and Alzheimer disease: an evolving perspective. J Neuroinflammation. 5, 7. Shen, Y., Tenney, A.P., Busch, S.A., Horn, K.P., Cuascut, F.X., Liu, K., He, Z., Silver, J., and Flanagan, J.G. (2009). PTPsigma is a receptor for chondroitin sulfate proteoglycan, an inhibitor of neural regeneration. Science. 326, 592-596. Sims, J.E., and Smith, D.E. (2010). The IL-1 family: regulators of immunity. Nat Rev Immunol. 10, 89-102. Takahashi, H., and Craig, A.M. (2013). Protein tyrosine phosphatases PTPdelta, PTPsigma, and LAR: presynaptic hubs for synapse organization. Trends Neurosci. 36, 522-534. Takahashi, H., Arstikaitis, P., Prasad, T., Bartlett, T.E., Wang, Y.T., Murphy, T.H., and Craig, A.M. (2011). Postsynaptic TrkC and presynaptic PTPsigma function as a bidirectional excitatory synaptic organizing complex. Neuron. 69, 287-303. Takahashi, H., Katayama, K., Sohya, K., Miyamoto, H., Prasad, T., Matsumoto, Y., Ota, M., Yasuda, H., Tsumoto, T., and Aruga, J. (2012). Selective control of inhibitory synapse development by Slitrk3-PTPdelta trans-synaptic interaction. Nat Neurosci. 15, Array-Array. Tanaka, H., Miyazaki, N., Matoba, K., Nogi, T., Iwasaki, K., and Takagi, J. (2012). Higher-order architecture of cell adhesion mediated by polymorphic synaptic adhesion molecules neurexin and neuroligin. Cell Rep. 2, 101-110. Thomas, C., Bazan, J.F., and Garcia, K.C. (2012). Structure of the activating IL-1 receptor signaling complex. Nat Struct Mol Biol. 19, 455-457. Tonks, N.K. (2006). Protein tyrosine phosphatases: from genes, to function, to disease. Nat Rev Mol Cell Biol. 7, 833-846. Um, J.W., Kim, K.H., Park, B.S., Choi, Y., Kim, D., Kim, C.Y., Kim, S.J., Kim, M., Ko, J.S., and Lee, S.G. (2014). Structural basis for LAR-RPTP/Slitrk complex-mediated synaptic adhesion. Nat Commun. 5, 5423. Um, J.W., and Ko, J. (2013). LAR-RPTPs: synaptic adhesion molecules that shape synapse development. Trends Cell Biol. 23, 465-475. Valnegri, P., Montrasio, C., Brambilla, D., Ko, J., Passafaro, M., and Sala, C. (2011). The X-linked intellectual disability protein IL1RAPL1 regulates excitatory synapse formation by binding PTPdelta and RhoGAP2. Hum Mol Genet. 20, 4797-4809. Wallace, M.J., Fladd, C., Batt, J., and Rotin, D. (1998). The second catalytic domain of protein tyrosine phosphatase delta (PTP delta) binds to and inhibits the first catalytic domain of PTP sigma. Mol Cell Biol. 18, 2608-2616. Wang, D., Zhang, S., Li, L., Liu, X., Mei, K., and Wang, X. (2010). Structural insights into the assembly and activation of IL-1beta with its receptors. Nat Immunol. 11, 905-911. Wiesmann, C., Ultsch, M.H., Bass, S.H., and de Vos, A.M. (1999). Crystal structure of nerve growth factor in complex with the ligand-binding domain of the TrkA receptor. Nature. 401, 184-188. Won, S.Y., Kim, C.Y., Kim, D., Ko, J., Um, J.W., Lee, S.B., Buck, M., Kim, E., Heo, W.D., and Lee, J.O. (2017). LAR-RPTP clustering is modulated by competitive binding between synaptic adhesion partners and heparan sulfate. Front Mol Neurosci. 10, 327. Woo, J., Kwon, S.K., Choi, S., Kim, S., Lee, J.R., Dunah, A.W., Sheng, M., and Kim, E. (2009). Trans-synaptic adhesion between NGL-3 and LAR regulates the formation of excitatory synapses. Nat Neurosci. 12, 428-437. Xu, Y., and Fisher, G.J. (2012). Receptor type protein tyrosine phosphatases (RPTPs) - roles in signal transduction and human disease. J Cell Commun Signal. 6, 125-138. Yamagata, A., Sato, Y., Goto-Ito, S., Uemura, T., Maeda, A., Shiroshima, T., Yoshida, T., and Fukai, S. (2015a). Structure of Slitrk2-PTPdelta complex reveals mechanisms for splicing-dependent trans-synaptic adhesion. Sci Rep. 5, 9686. Yamagata, A., Yoshida, T., Sato, Y., Goto-Ito, S., Uemura, T., Maeda, A., Shiroshima, T., Iwasawa-Okamoto, S., Mori, H., and Mishina, M. (2015b). Mechanisms of splicing-dependent trans-synaptic adhesion by PTPdelta-IL1RAPL1/IL-1RAcP for synaptic differentiation. Nat Commun. 6, 6926. Yim, Y.S., Kwon, Y., Nam, J., Yoon, H.I., Lee, K., Kim, D.G., Kim, E., Kim, C.H., and Ko, J. (2013). Slitrks control excitatory and inhibitory synapse formation with LAR receptor protein tyrosine phosphatases. Proc Natl Acad Sci USA. 110, 4057-4062. Yoshida, T., Yasumura, M., Uemura, T., Lee, S.J., Ra, M., Taguchi, R., Iwakura, Y., and Mishina, M. (2011). IL-1 receptor accessory protein-like 1 associated with mental retardation and autism mediates synapse formation by trans-synaptic interaction with protein tyrosine phosphatase delta. J Neurosci. 31, 13485-13499. Yoshida, T., Shiroshima, T., Lee, S.J., Yasumura, M., Uemura, T., Chen, X., Iwakura, Y., and Mishina, M. (2012). Interleukin-1 receptor accessory protein organizes neuronal synaptogenesis as a cell adhesion molecule. J Neurosci. 32, 2588-2600.